Why is it that the morning of your wedding or other important event is the morning your skin rewards you with a big zit? Or the day of your important job interview is the day your eyes look the puffiest, as if you’d been out all night the night before? What are you supposed to do with that embarrassing pimple? We have potential fixes for the five most common skin problems below. Start with ice. It helps reduce the swelling, which is what is most difficult to cover-up. Leave it on the skin for at least ten minutes if you can, then pat dry and apply your favorite spot treatment. If you don’t have any, try hydrocortisone cream. If you have time, you can also mix some baking soda with water to create a paste, and leave that on the affected area for 5-15 minutes. A quick trick: soak a cotton swab in anti-redness eye drops and hold on the pimple for five minutes. Whatever you do, don’t pick! You’ll only make the swelling worse. The only exception is if the whitehead is really visible and easily expelled. If you can gently get rid of the gunk, do so, and then immediately apply the ice and the other treatments noted above. Follow with a little non-clogging moisturizer to help offset dryness later in the day. Once you’ve gotten the swelling down, use a brush to twist a bit of concealer into the area until it’s completely hidden. Blend the edges with your finger. Apply foundation as usual, using a brush to blend around the blemish. Use powder sparingly, as it can make the pimple more visible. Redness can quickly take away from that uniform, flawless look we all want. Whether it shows up on your cheeks, nose, or anywhere else on your face, it indicates inflammation and irritation, and can not only look less than attractive, but may feel icky too. Your first step is to tame that inflammation. Our Rescue + Relief Spray was made for this! It contains heat-removing, cooling ingredients like water lily and cucumber, as well as anti-inflammatory ingredients like chamomile, comfrey, and valerian. Spray a little on your skin for a cooling, refreshing mist that will help tame inflammation and redness. If you don’t have this product, try aloe vera gel, or another type of cooling mask. Leave on for 10-20 minutes to help skin calm down. If you don’t have either of these, try mixing some cooked oatmeal and yogurt and apply, or use some cooled green tea on a cold cloth. Rinse off. Then mix in a small drop of hydrocortisone cream with your moisturizer and apply before your makeup. Finally, use a yellow-based concealer to hide the redness before applying foundation. You don’t want to look tired for that important morning meeting or event. Would you believe that a hot shower is your best solution? 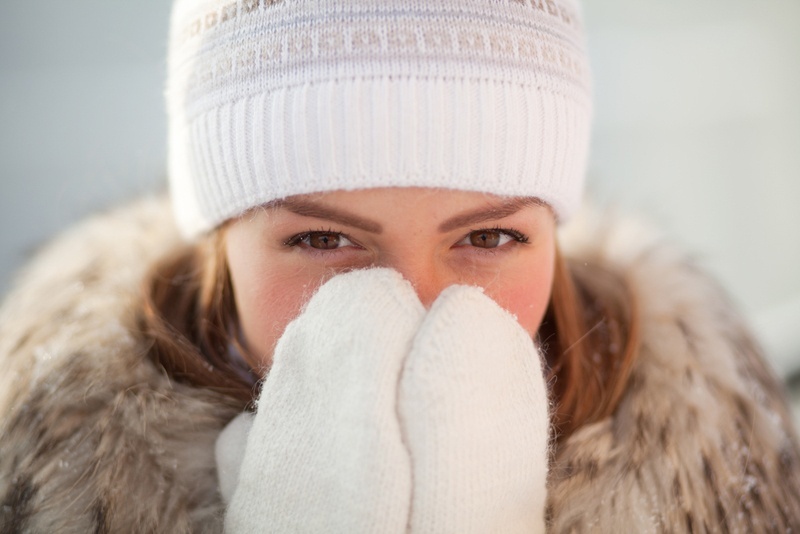 We usually think of ice for puffy eyes-and that is a good next step-but hot water can help stimulate circulation, which may encourage drainage in the area around your eyes. Don’t be afraid to put your face right in the stream of water and let it do its work. Once you get out and dry off, then apply your cool compress, ice pack, or bag of frozen peas. Leave it on your eyes for 10 minutes. If you have time, apply again after another 15 minutes has passed. Finally, massage in your favorite eye cream. Follow with a light concealer-make sure it’s not too heavy, or it will simply settle into fine lines and exacerbate the problem. Use a brush for a more blended application. This can ruin anyone’s day. You put on foundation and it looks dull and broken because of your dry, flaky skin. Maybe you just got a chemical peel, or you’re suffering from sun damage. Either way, you can apply moisturizer, but the flakiness could return in a couple hours. It’s time for an emergency fix. Warning: be very cautious. Your tendency will be to pick at the flakes, but that could cause lasting damage and scars. If you’re suffering from excess dryness caused by lack of moisture, try a quick exfoliation with a dry skin brush or cleansing brush. (If your skin is recovering from a peel, skip this step and go to the next.) Apply an aloe vera gel or skin oil first to protect skin. Rinse and pat dry, and then apply your favorite hydrating mask. If you don’t have one, use ingredients like honey, yogurt, mashed bananas and avocados, cooked oatmeal, and olive or sweet almond oil to make one. Leave it on for 10-15 minutes, rinse, and apply your regular moisturizer. Top with a liquid foundation and skip the powder. You don’t want to go to your special event looking dull and blah, but your skin isn’t cooperating. It just looks lifeless. Start with a bit of exercise to get the blood flowing. Jump rope for a minute, run in place, or do your best 50 jumping jacks. Then, choose your favorite facial scrub to wake up your skin. Avoid damaging nut and bead scrubs, and choose those with gentler ingredients instead. If you don’t have a scrub handy, use crystallized honey, brown sugar, or sea salt mixed with your favorite natural oils, like olive, jojoba, almond, or coconut. Wet skin first, and then massage gently for a couple minutes. Rinse, and apply your favorite moisturizer or facial oil. Finally, you can fake a bit of glow with a highlighter, but go easy on application. Tap up and down the cheekbones, dab a little on the brow bone, and finish with a little on the tip of the nose and chin. Do you have solutions for skin emergencies? Please share your tips with our readers.